Andy G. and Ian C.
I decided to go all-in for the UCM, and have finally started to get some of my fleet built and painted. 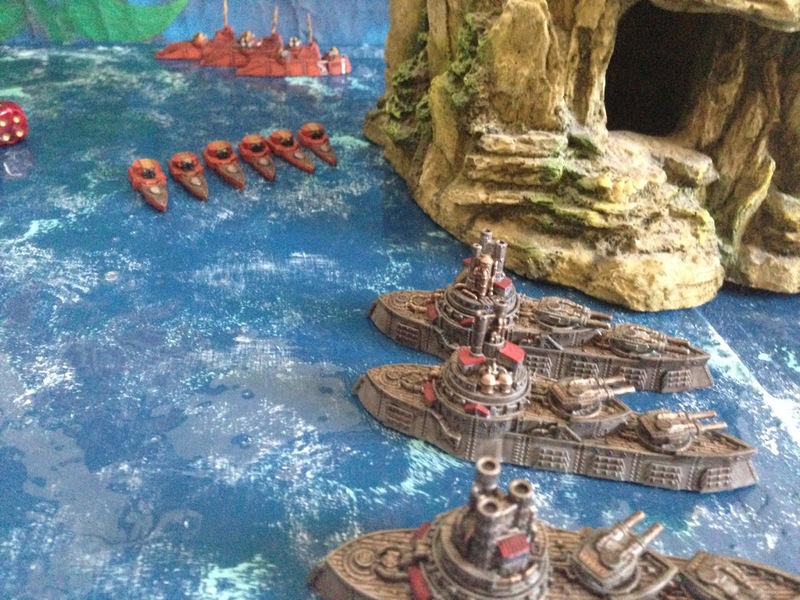 Here are my first finished vessels – three Osaka-class light cruisers, namely the Witch Hunt, Ghost Rider, and Spirit of Radio. 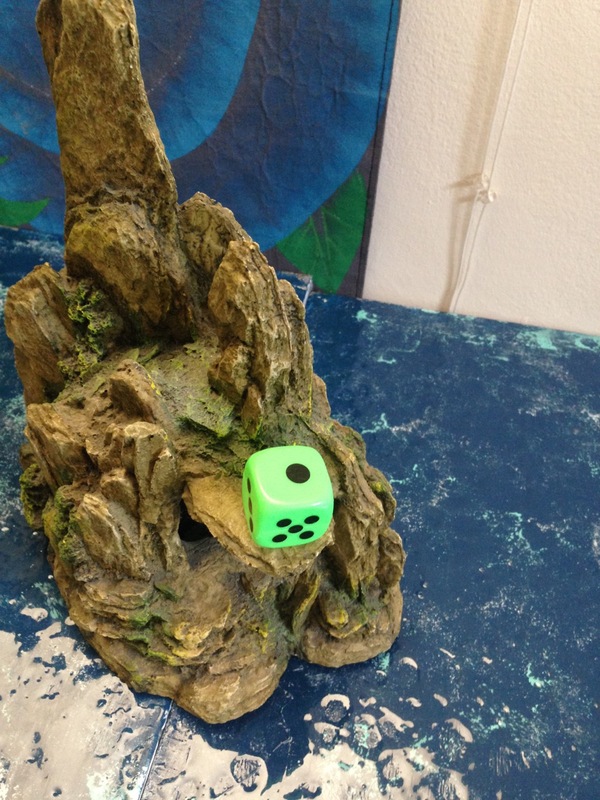 The primary color is Citadel’s Stegadon Scale Green; Averland Sunset is the yellow. A black wash provides depth, especially for the Administratum Grey areas. 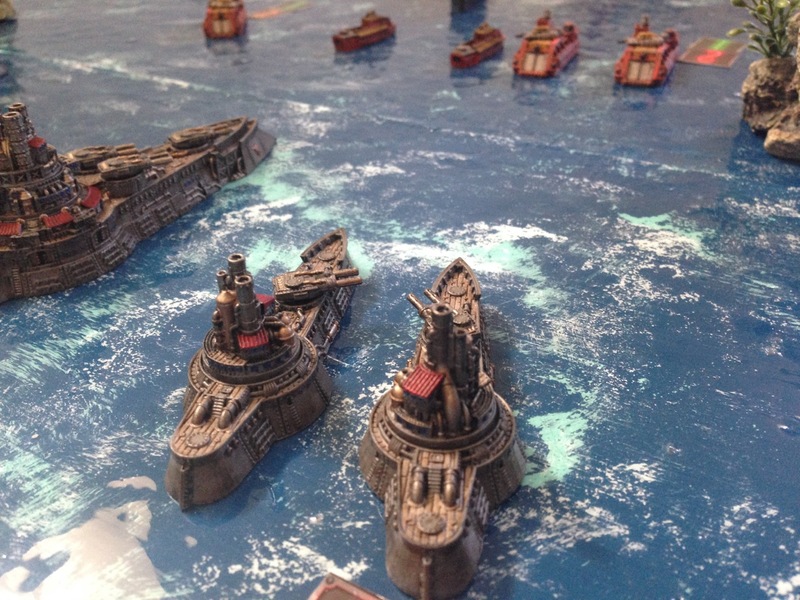 Ironbreaker and Enchanted blue round out the paints – a basic scheme, for a basic fleet, for the hard-working troops and sailors of the United Colonies. 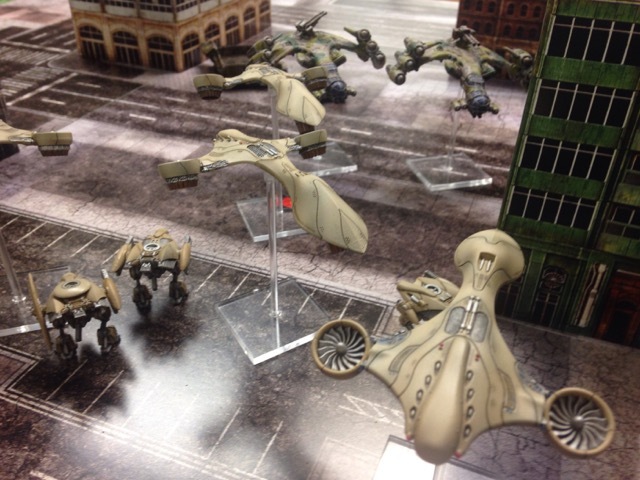 Here are pictures from a game several weeks ago. 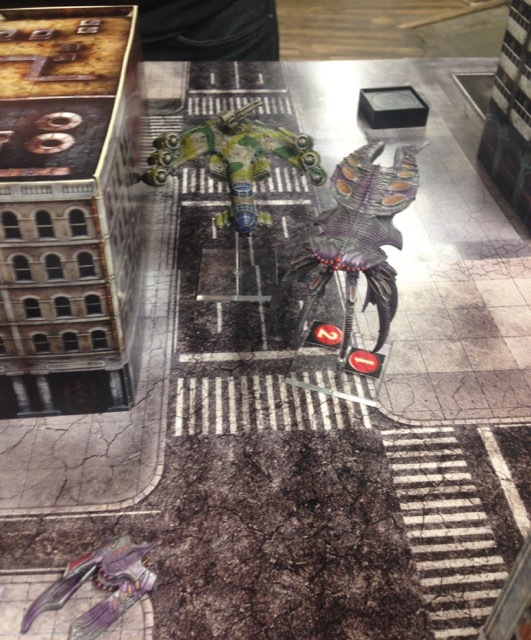 It was a close affair, but the Scourge took the day with a 6 to 5 victory (I think). 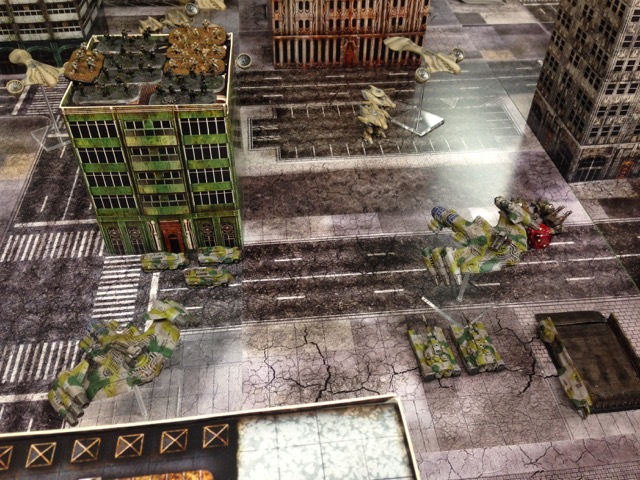 Both commanders were downed, and a massive infantry scrum happened over one objective. Good game! 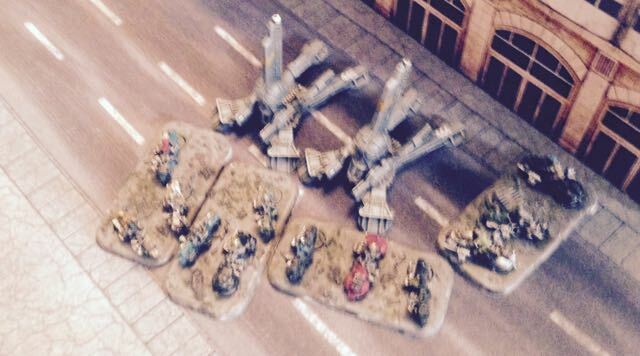 Spider mine launchers on the Jacksons. 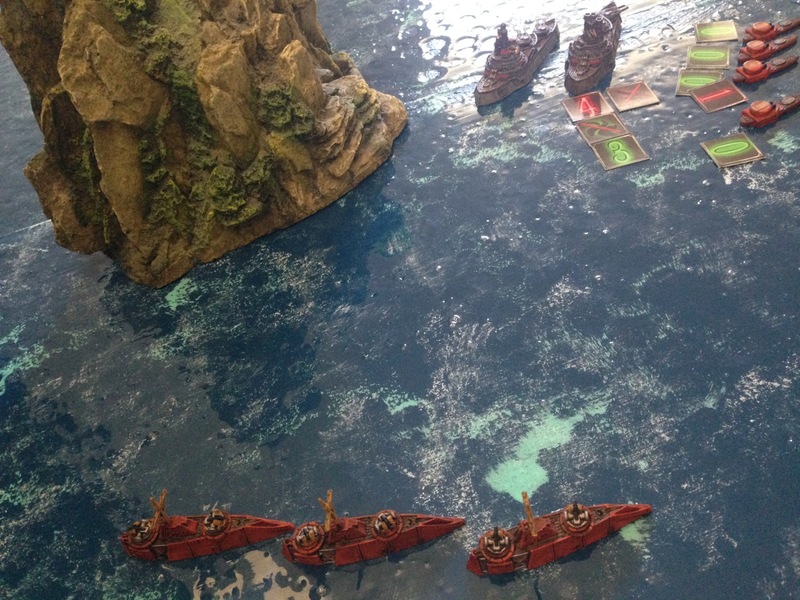 Fortunately, the game was a lot of fun – unfortunately, my picture taking was really spotty. It’s also been several days since the game itself, so I will summarize. There was no shooting in turn 1. 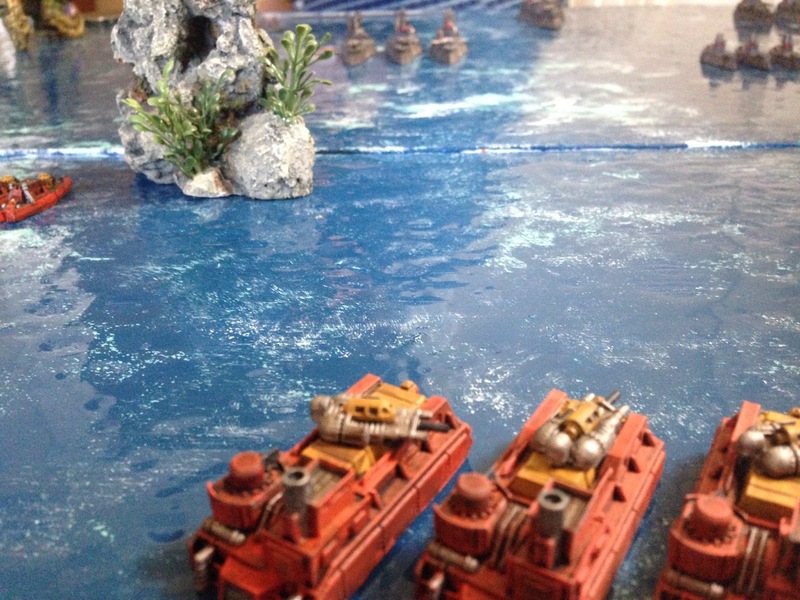 My command battlegroup deployed on the left side, initially in cover. This was in direct reaction to his Gladius HBT section, whose Condor dropped them off in the street ahead. 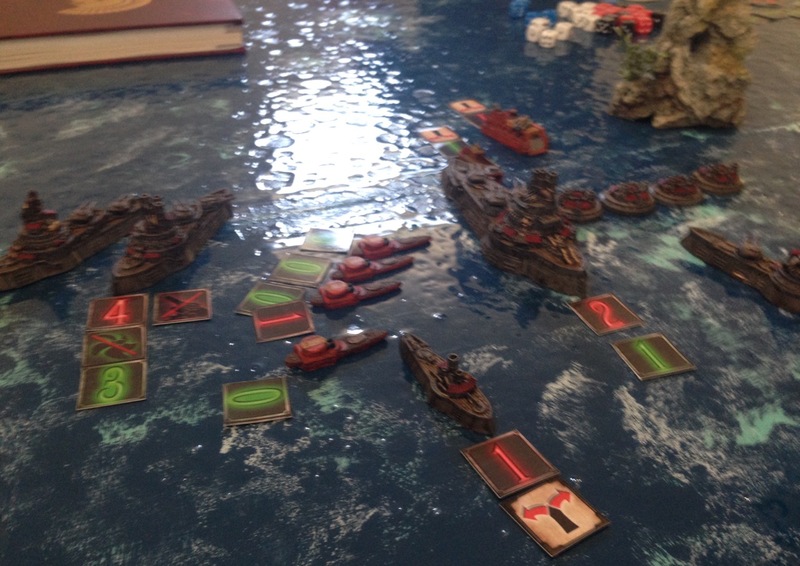 I initially thought this was a clever move – however, over the following several turns, the Alexander moved out of cover and proceeded to do NO DAMAGE AT ALL to anything, and was eventually blown away by the combined fire of the Gladii, Sabres, and even a few blasts from the Kodiak’s friend in space. I think that happened at the bottom of turn 4. 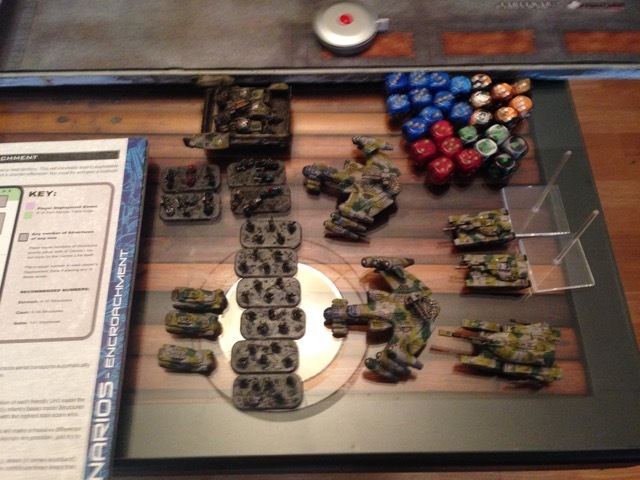 At the time, I thought that would be the end of the game – destroying my most expensive unit and killing the commander within was a mighty chunk of kill points. However, with so much of the UCM forces concentrating on the exposed Alexander, it allowed for some substantial maneuvering by the rest of my force. 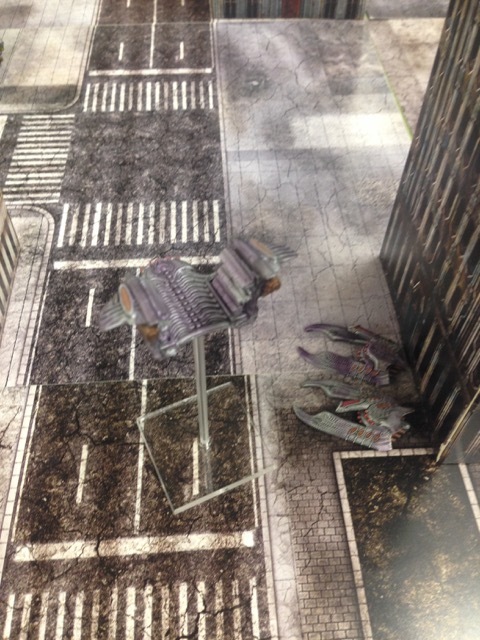 In particular, the Freeriders rode hard down the table edge and found some juicy targets. A piece of trash on the ground! Part of an old straw wrapper one of us tracked in from the street. It did a good job hiding the heavy tanks from the then-extant Alexander. Despite the immediate cessation of the smart smoke, the Alexander and some Lifthawk missiles failed to hit and/or damage the Gladii. Dang. 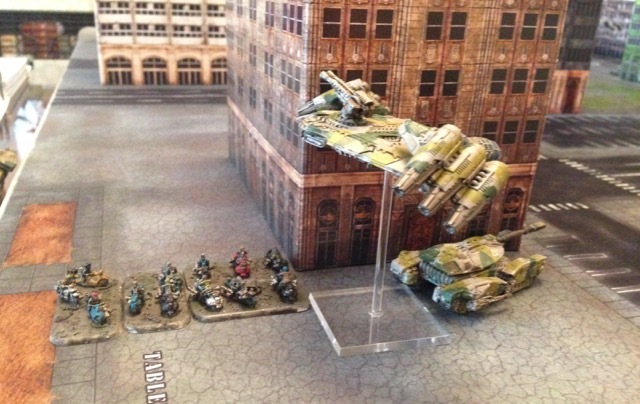 Anyway, I had originally planned to use the Freeriders to put an end to the heavy UCM tanks, but the destruction of my commander gave me a better idea – go after the Kodiak. And they did. 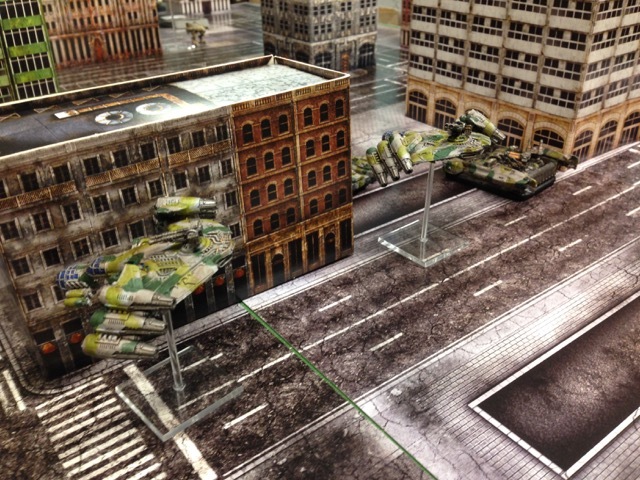 Over the final two turns or so, almost the entire UCM army redirected their gatling guns, heavy machine guns, anti-air revolving cannon, and missile pods against the Freeriders. There were not many other targets, though, and also not enough mobility to get into my deployment zone before the end of turn 6. 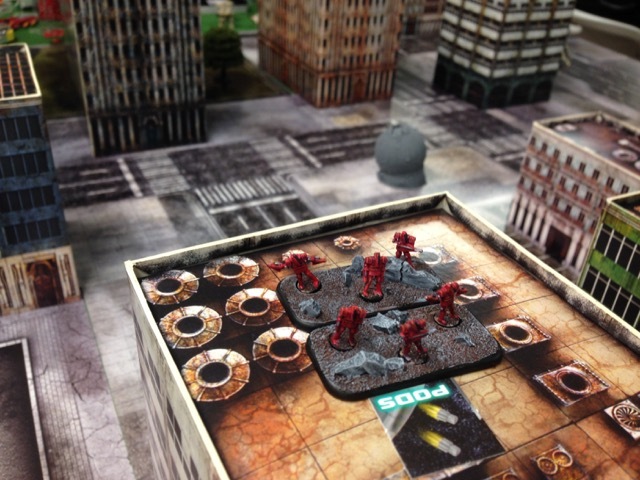 Literally thousands of rounds, bullets, and missiles later, Seb’s UCM force had – to their credit – managed to destroy two entire bases of the Resistance scouts. No easy feat! This attrition also kept the Freeriders from destroying their target and killing the enemy commander. 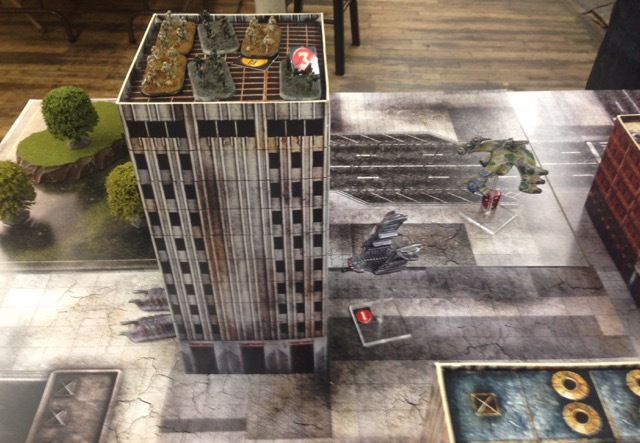 On the other side of the board, the UCM Legionnaires had swiftly deployed in a medium building towards the middle of the table – and my own infantry were just too far away to get in the building and engage them without first being subjected to a concerning amount of fire. 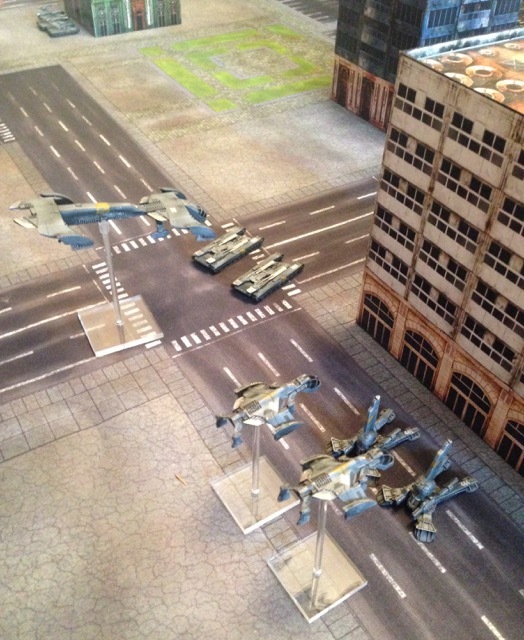 Instead, the Lifthawk carrying all thirty Resistance fighters – no doubt airsick by the end of the game – re-positioned and flew across to the other side of the table. 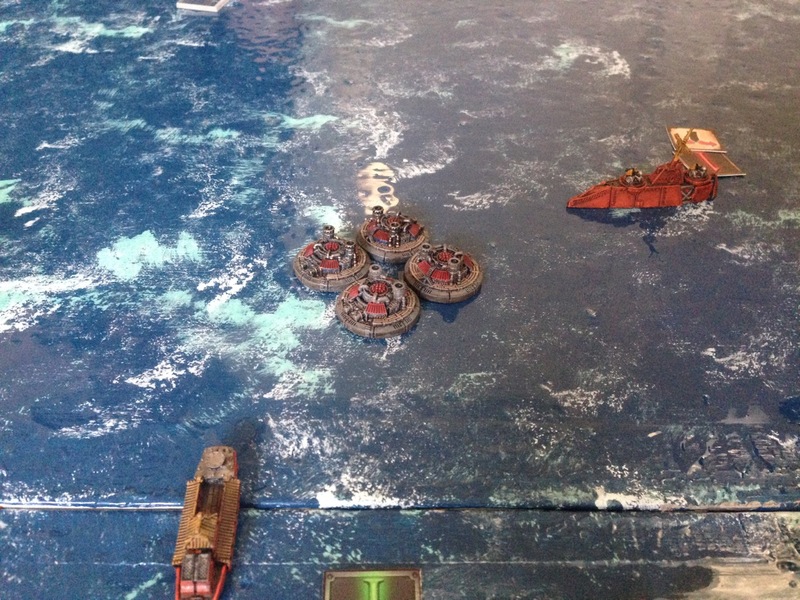 Meanwhile, my Gun Wagons made steady progress in their Kraken, all the way up the far right side of the board. 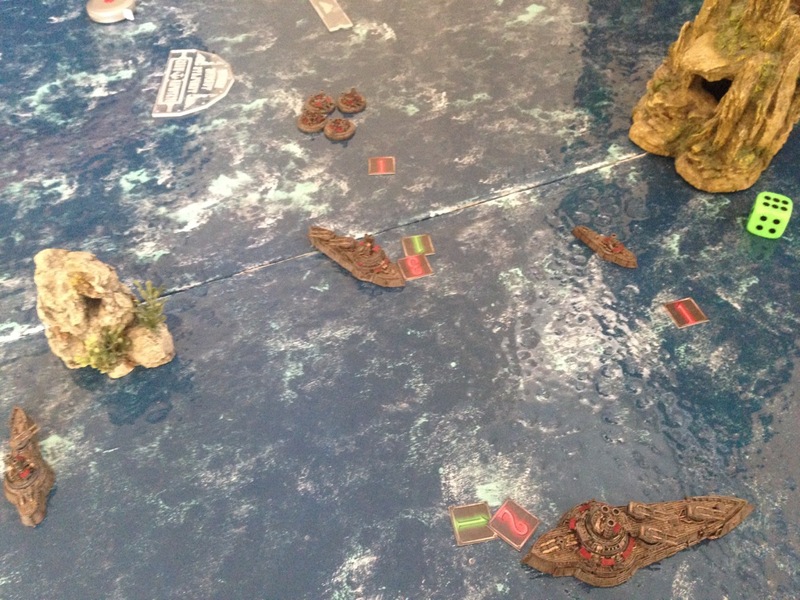 In turn 6, the Gun Wagons and their Kraken made it into the enemy deployment zone, as did all thirty Resistance fighters, who took up shelter in a large building barely in the UCM deployment area (immediately next to the Kodiak!). 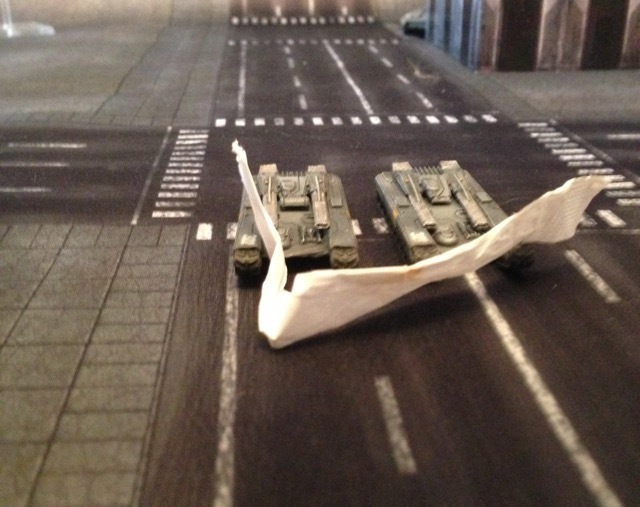 The two Lifthawks also managed to do a little damage, but not enough to earn kill points. In the end, those infantry won me the game – that triple points bonus is huge. My drive-on Hannibals did not end up achieving very much. 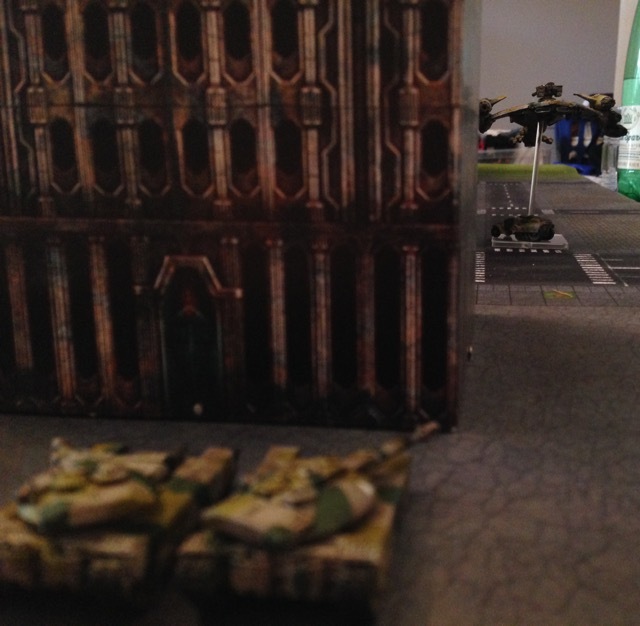 Spending the first turn sheltering behind the large building in the Resistance deployment zone, they ended up driving out and unloading turn after turn on the building the Legionnaires garrisoned. 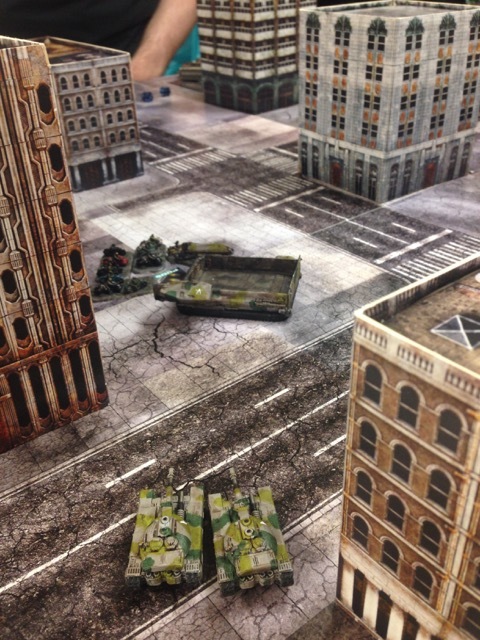 By the end of the game, the MBTs had killed a base-and-a-half of the UCM infantry, in return losing one of their own to Sabre fire. 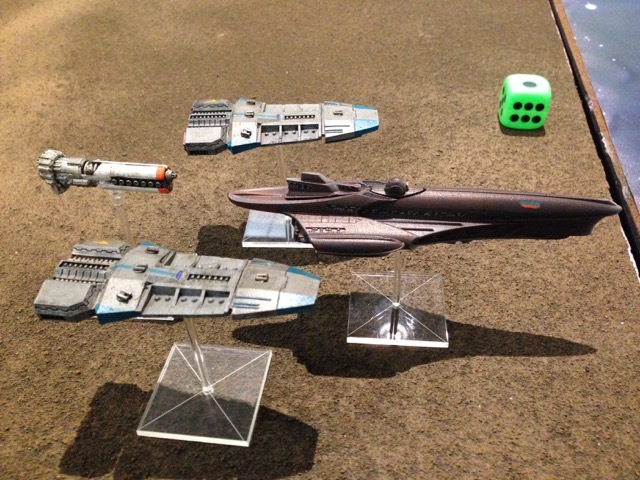 Seb and I both agreed after calculating kill points that we would have played the game very differently had either of us realized we had misread/misunderstood the victory conditions for the Encroachment mission. But it was still a lot of fun! Had I not thrown those fighters in the building on turn 6, I would have lost. Besides the actual rules for Encroachment, I felt like I learned a lot in this game. The Alexander is not invincible, for example (although it did take a lot of pepper to bring it down) – nor are Freeriders (although, again, I love those evasion countermeasures). I really need a third Lifthawk to get the most out of my heavy armor (and then I could play at the ~1000 points level even). Lifthawks are not very dependable AA. 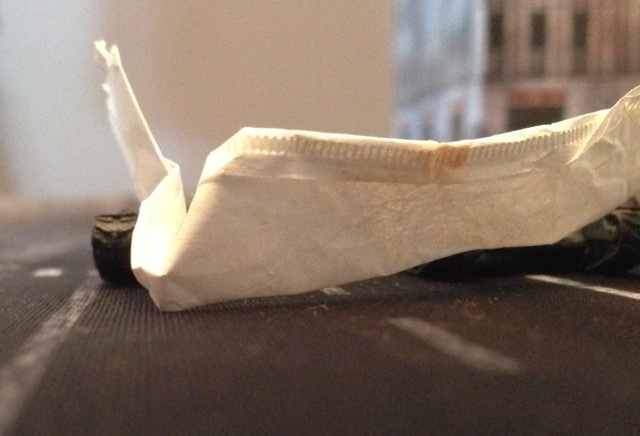 Straw wrappers make good smart smoke. 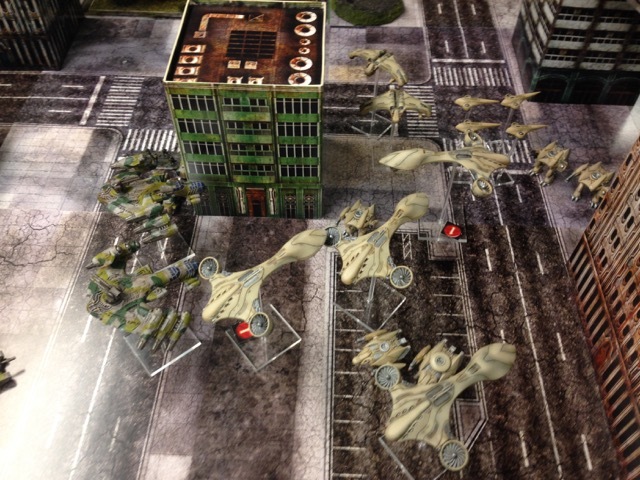 Had some more fun Dropzone Commander games last weekend. I am really loving this game! Here are some pictures from the two games. 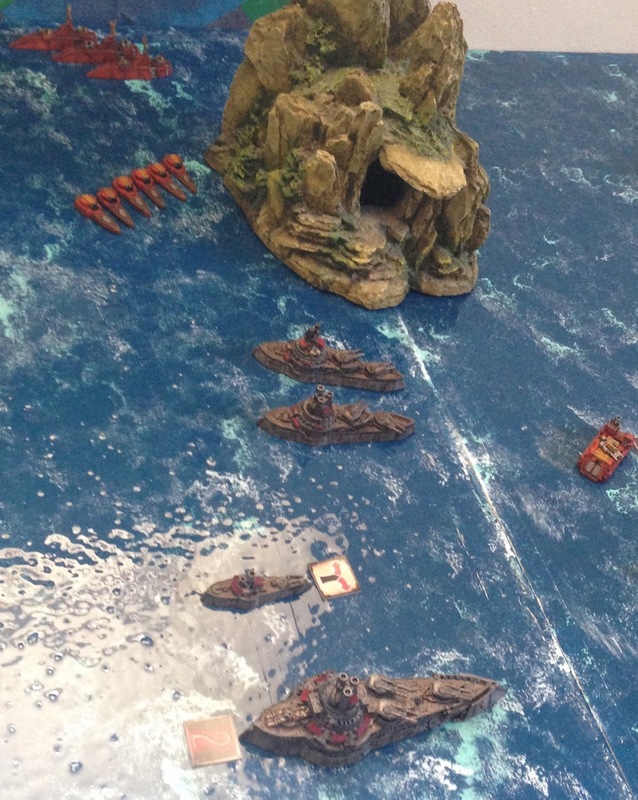 CaptainCon 2015 was a great time! It was really nice to spend the weekend with some like-minded gamers. 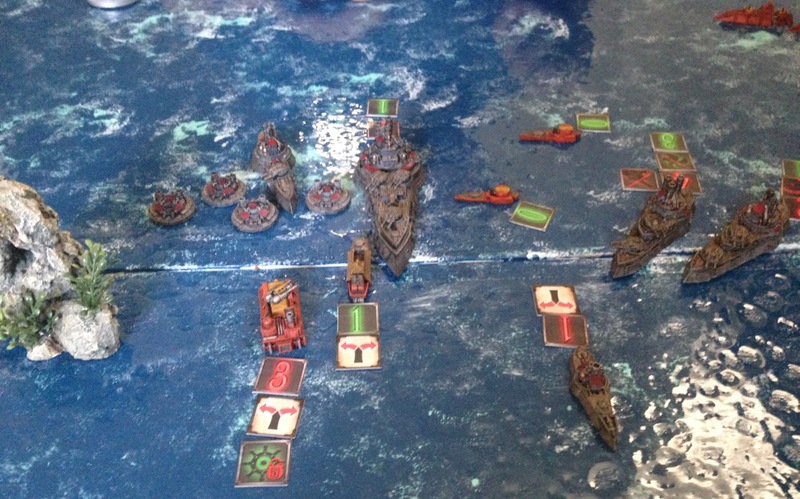 Here are a few pictures I took of demo games we played or ran. 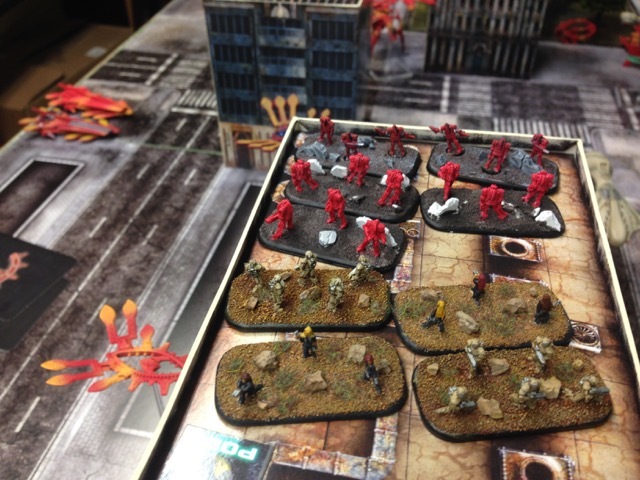 Kraig was generous enough to show us how Warzone: Resurrection plays, using a small Bauhaus force versus an Imperial starter set. 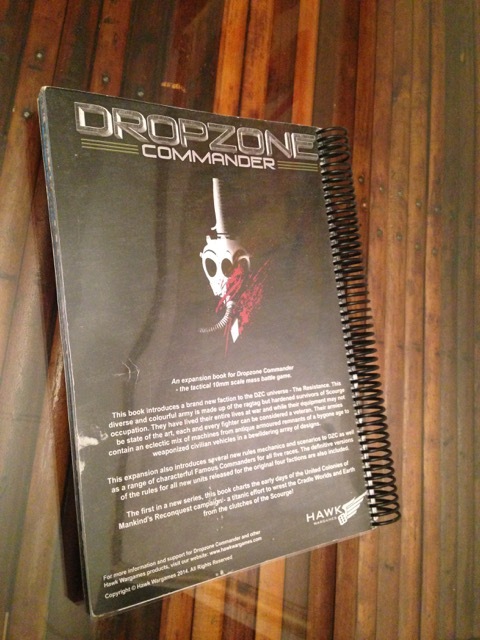 Over the two days we ran quite a few Dropzone Commander demos. Hopefully we’ll get some new blood in the area! Brian and Peter did have luck running some Firestorm Armada demos, and after hours we got about half of a small game in, my Sorylians versus Peter’s Dindrenzi. 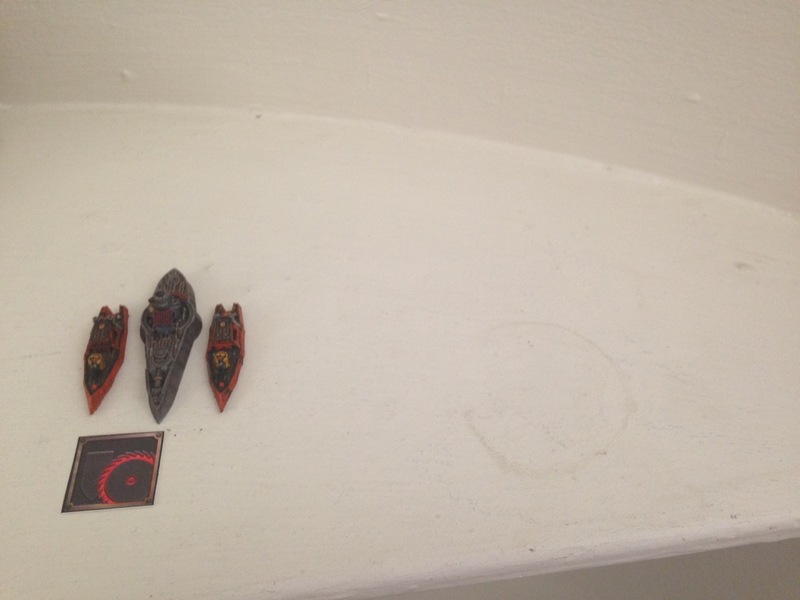 These ships did not participate in that battle. 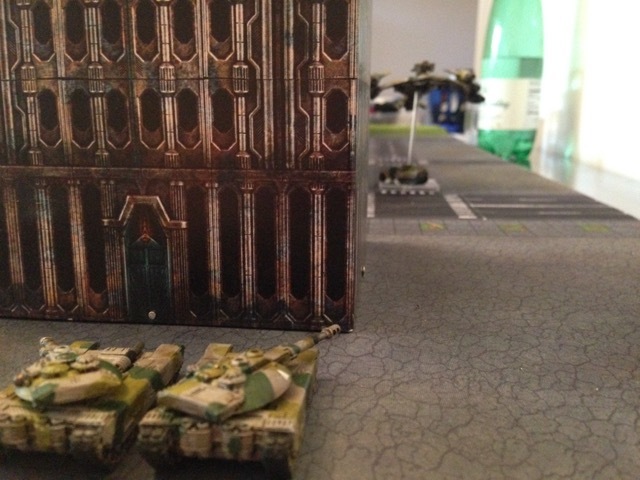 Last week I finally got in a solid playtest game for the Canons de Zibeline (Jack-O-Lantern Company) Mercenary Company. 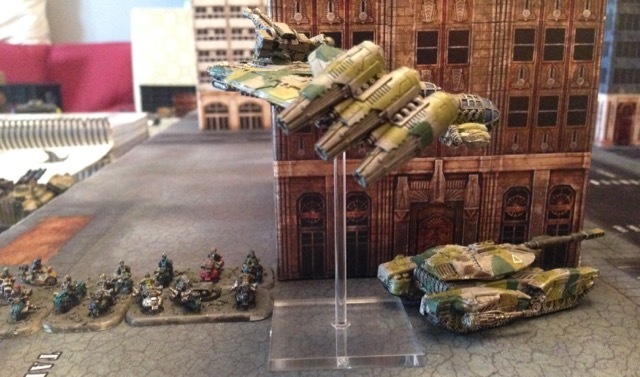 To find this homebrew faction’s current force guide and rules, please scroll down to the NEXT post on this blog. 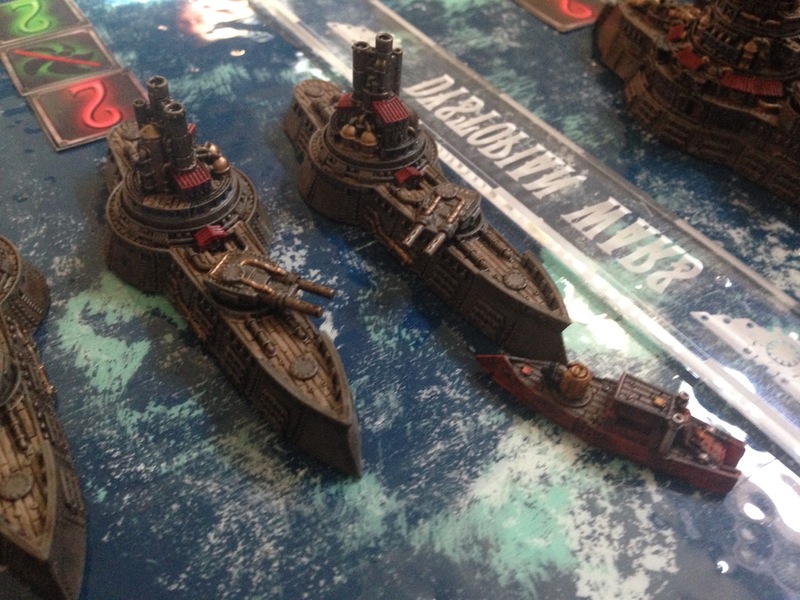 My good friend Seb was generous enough to sport the opposing side, using 1000 points of my Russian Coalition naval ships. 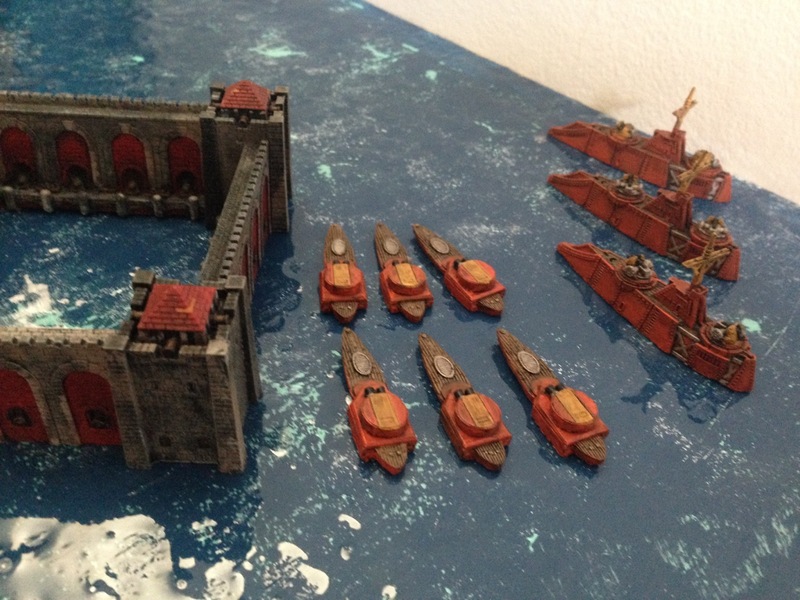 I commanded a flotilla of 1000 points of mercenaries, using the most up-to-date rules (again, see below for these). 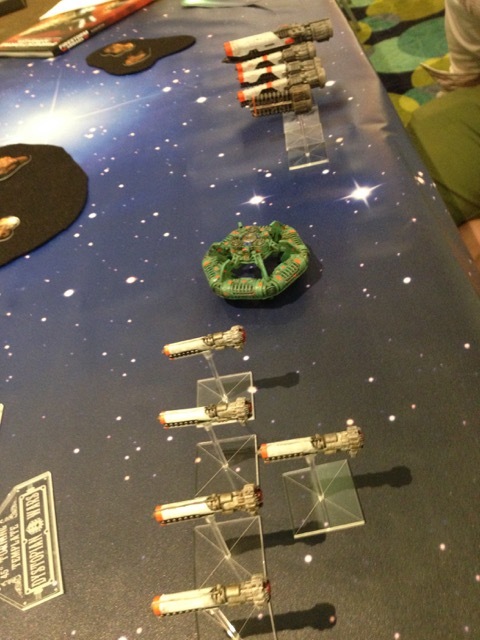 We played a straight battle, with the prime objective being to see how the updated Mercs did against an official fleet. 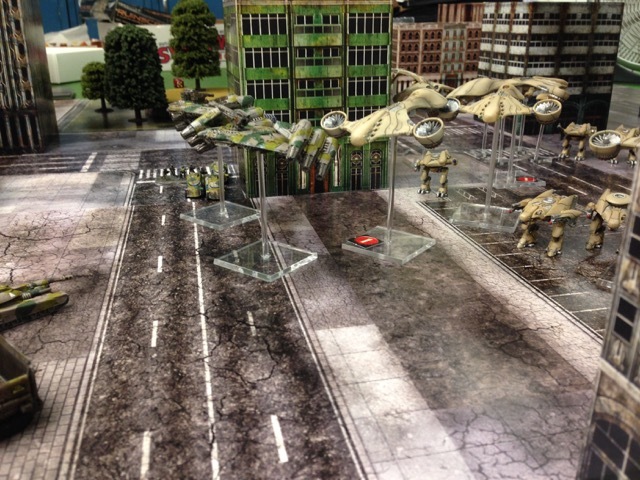 Terrain was sparing. 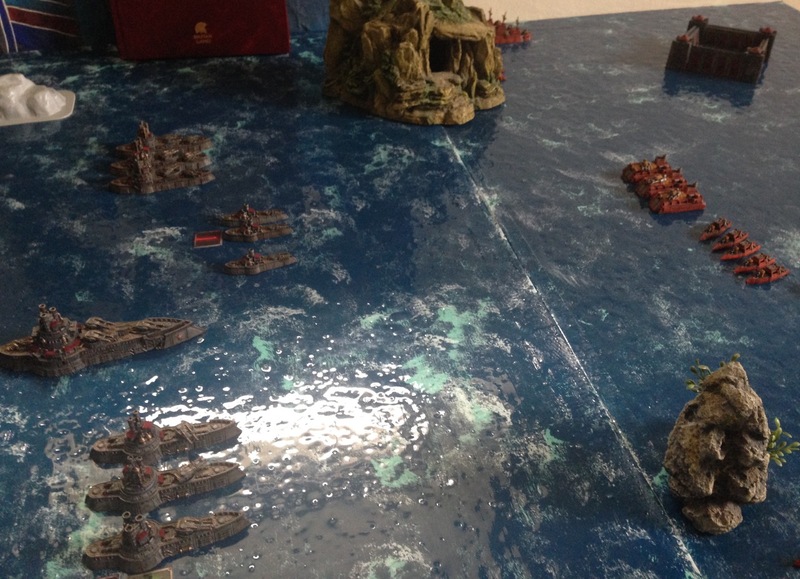 This is less of a battle report and more of a photo gallery. I’ve included some notes about the force’s performance at the end of the post. 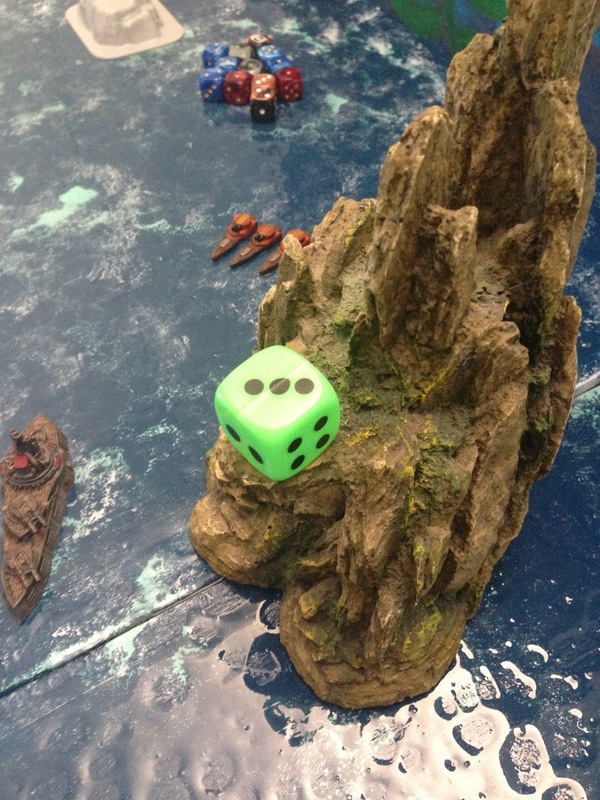 Sorry upfront about the glare on the ocean board – these photos were just quick in-the-thick-of-rolling-dice shots. 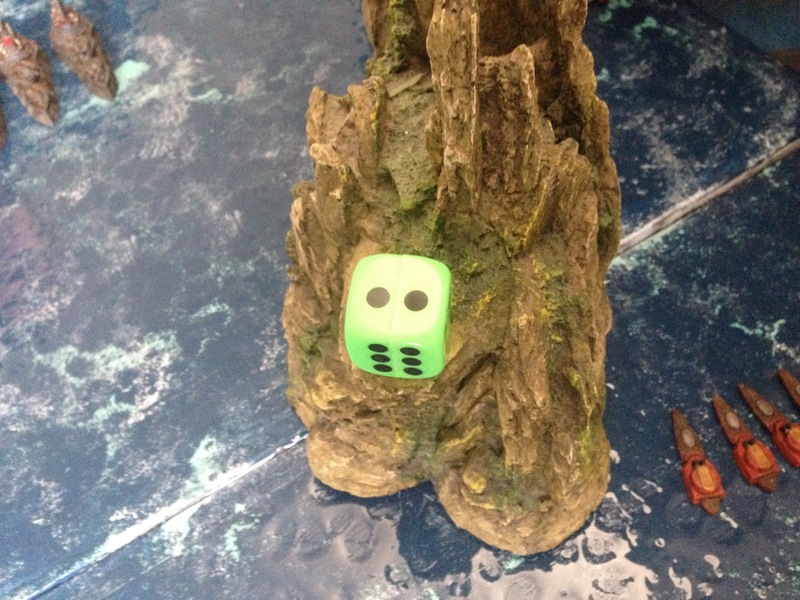 We used this fake die as the turn counter. 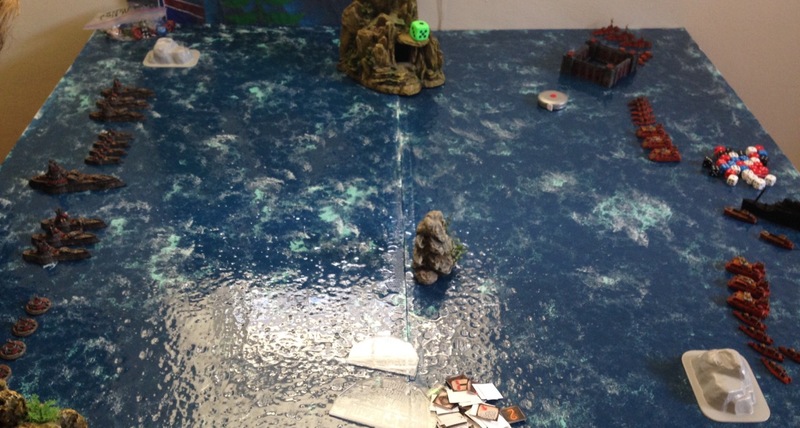 Watch out for that tectonic plate action in the middle of the ocean! 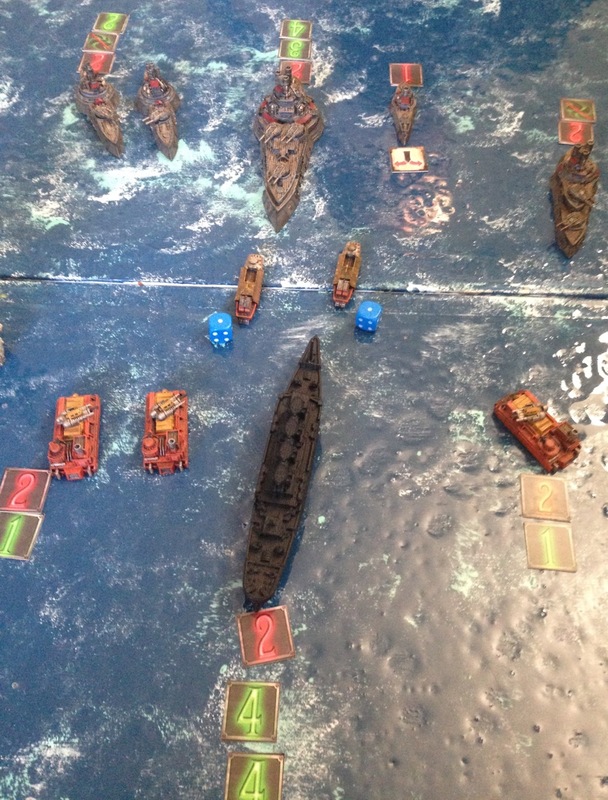 This game ended up with a truly surprising number of ramming actions. 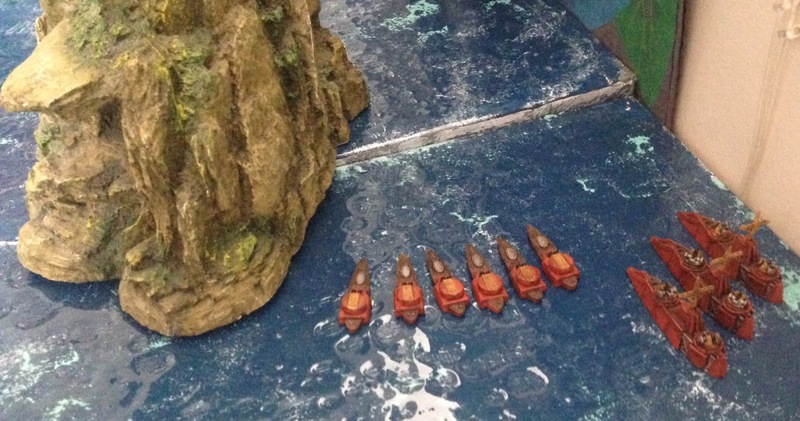 By the middle of turn 2, the center of the board was full of models from both sides. The undeniable King of the Ram in this game was the Suvorov cruiser. Here’s a truly amazing roll I had. 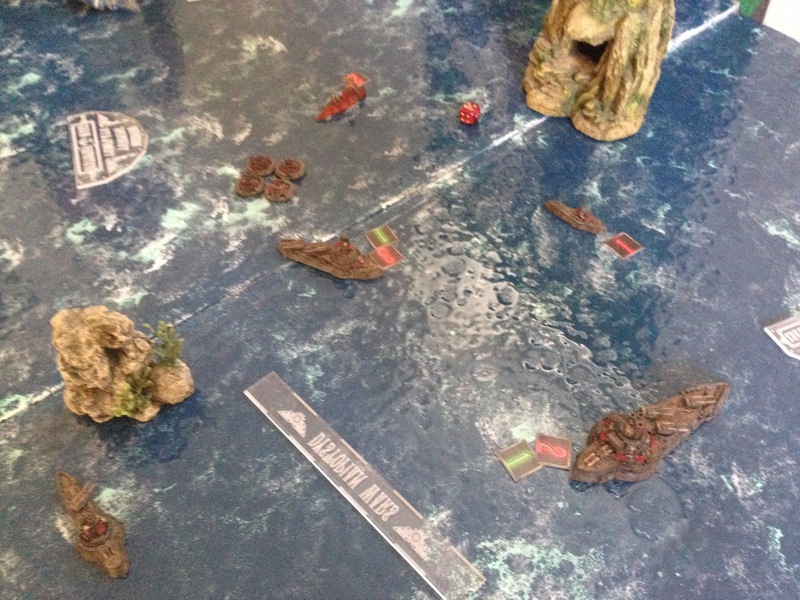 I believe this was from the corvettes firing on the RC gunships – and they scored a good number of hits! I like to memorialize the little victories I get. The lone survivor! These poor souls made it all the way to Turn 6, and even won the activation to go first. Alas, they did not survive the battle. It was a bloody match! There were lots of disorder checks throughout the entire game. Overall, I was very satisfied with the performance of the CdZ in this game. 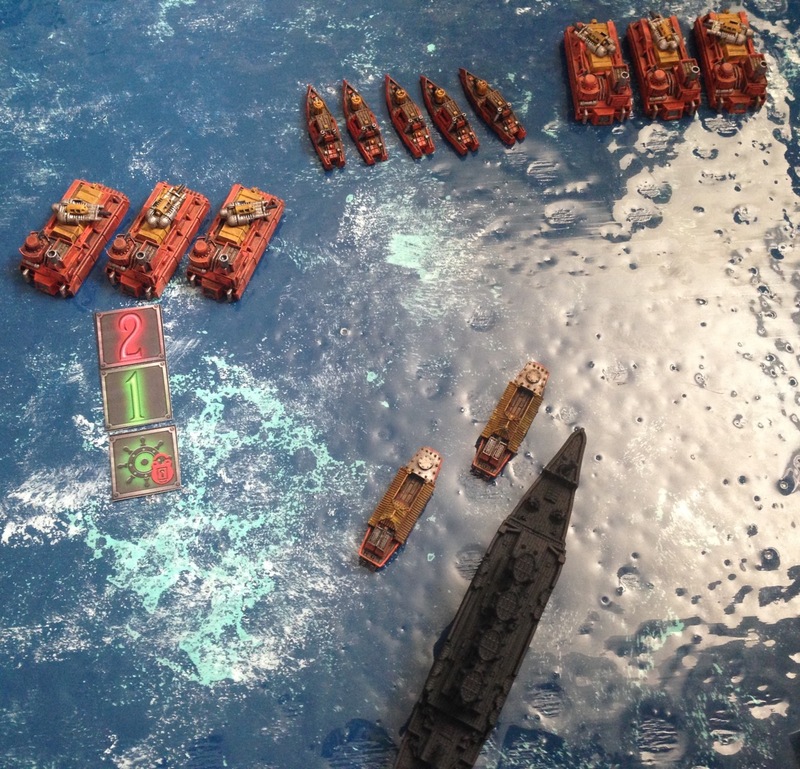 Although by the final turn the Russian victory was fairly lopsided, I think the mercs really held their own, especially in the beginning of the game. 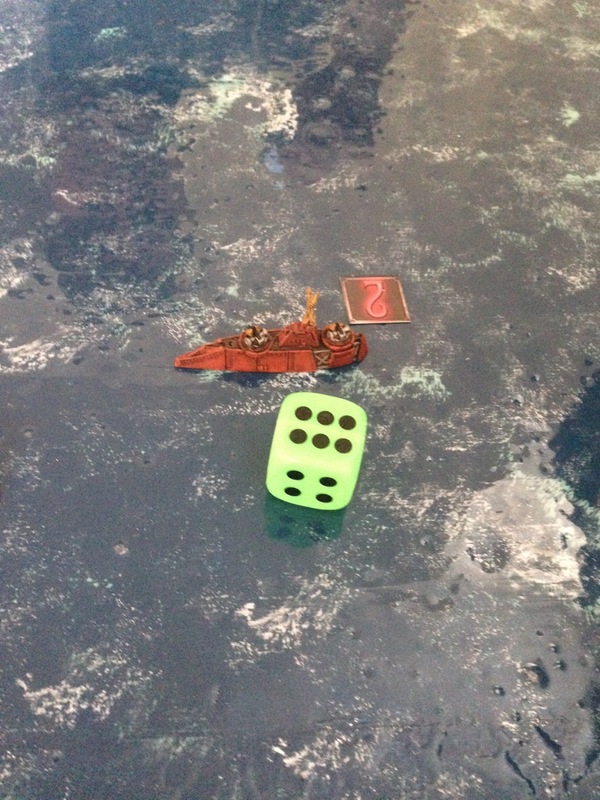 Up until the failed flagship boarding action I think the game could have gone either way. 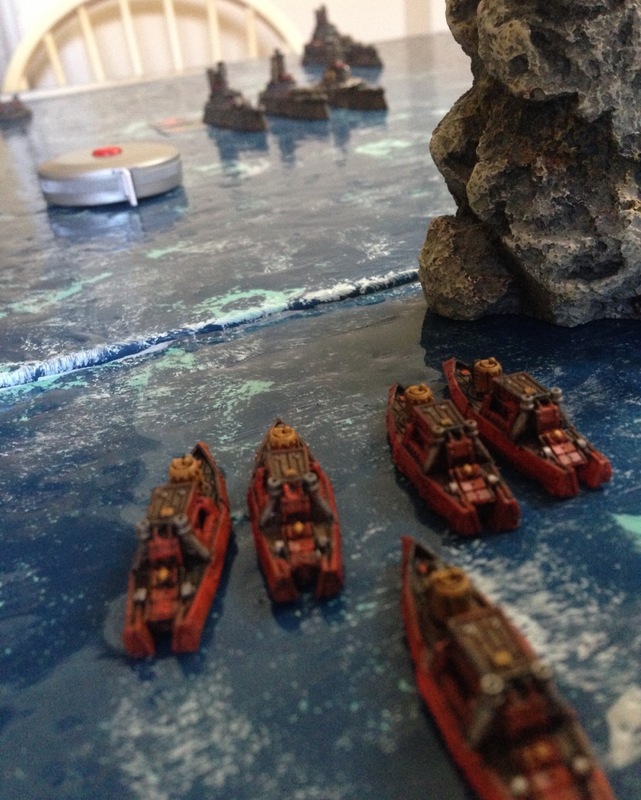 Some poor dice rolls and a few tactical errors on my end and the Russians won a resounding victory. 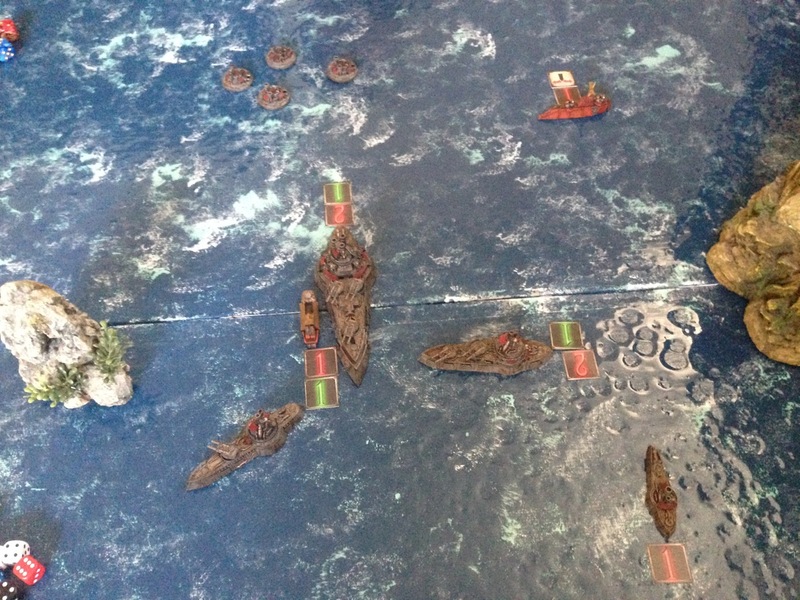 There were three major errors that I made in the mid and late game that had a major impact on the CdZ defeat. 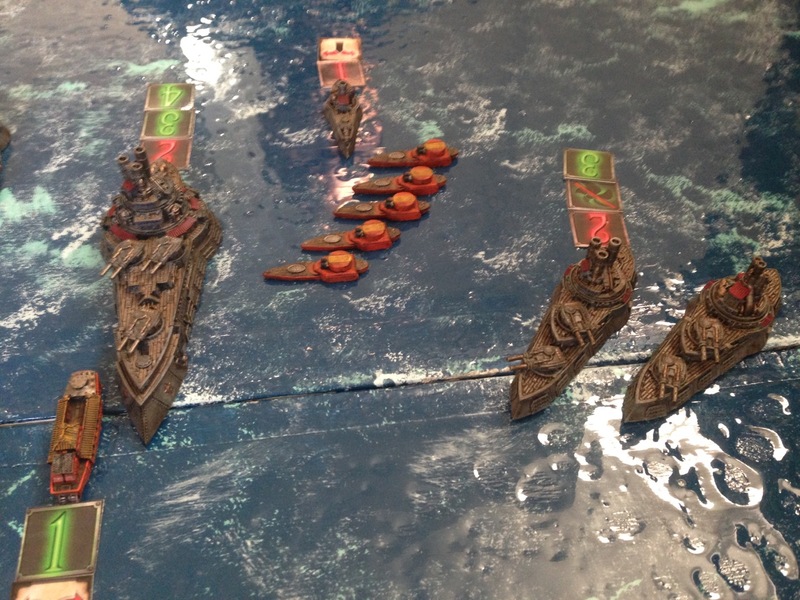 -First, I forgot to use the Commodore’s ability to give all vessels the “Long Range Assault” MAR for a turn – and had I used it that turn, things might have gone very differently…Without it, several of my squadrons were just out of range of boarding. Oops. 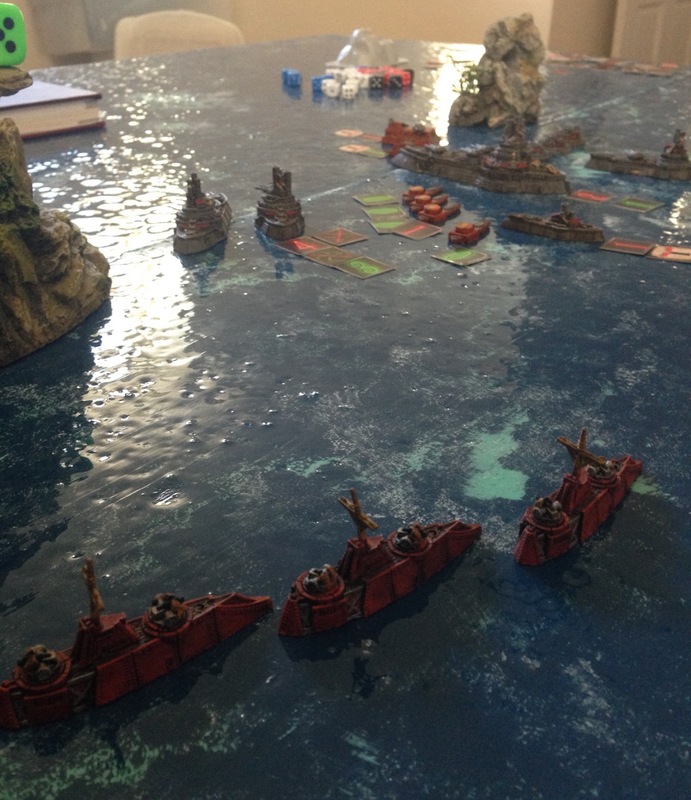 -Third, flush with confidence after the corvettes rolled so incredibly against the gunship squadron, I ran them directly towards the Borodino and shot, boarded, and rammed over 2 turns with everything they had. 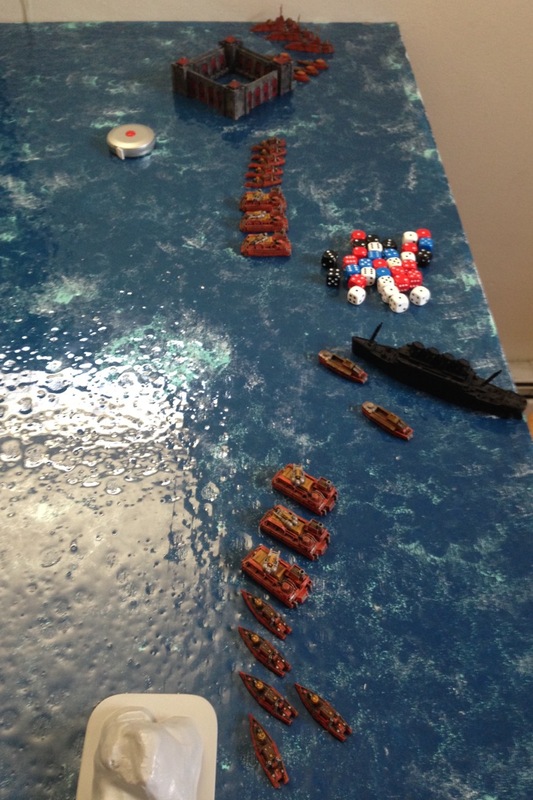 The result: all the corvettes were destroyed, and I don’t think the Borodino was even hit critically. Instead, I should have kept my corvettes moving in the backfield, where their speed and 360° firing arc would make them real pests for the Russian Coalition mediums. Oops! Without these three mistakes, I think the end result would have been much closer (but maybe still a Russian win). 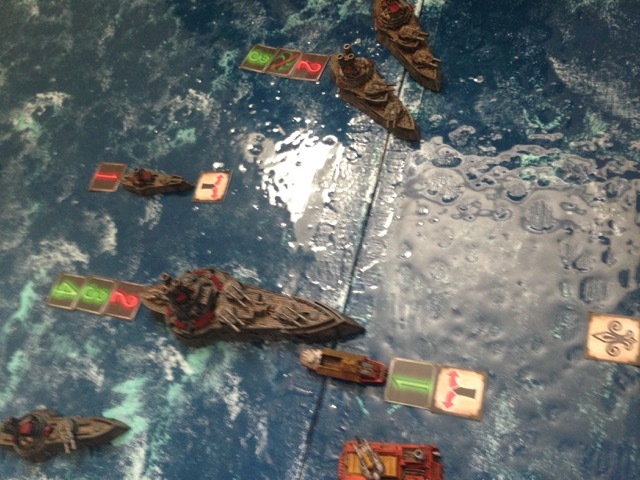 Seb, of course, did a solid job plowing into my forces and unleashing all those range band 1 and 2 guns the RC boast. Still, lessons learned for the next battle! After this game I actually feel really pleased with the condition of the Jack-O-Lantern Company. I really like that as a force some of their primary advantages are large squadron sizes (frigates are 2-5 and corvettes 3-6!) and more activations than your opponent. 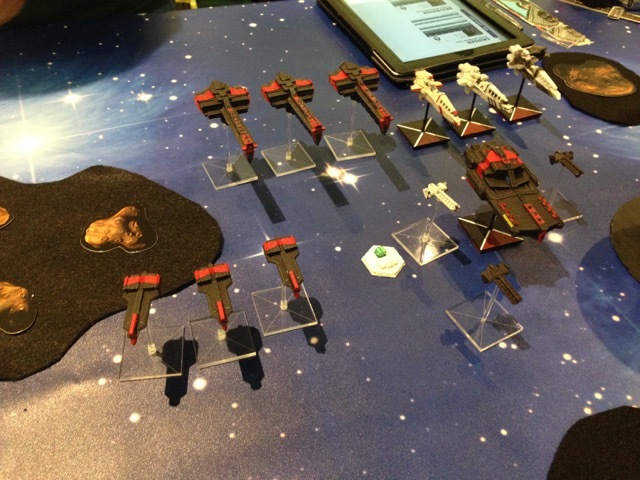 To me, that fits with the mercenary/pirate operation – small ships, swarm tactics, boarding, no generators. I really liked how the combat escorts functioned – as the guns of the flagship, essentially – and the pocket cruisers took more than their share of damage throughout the game. 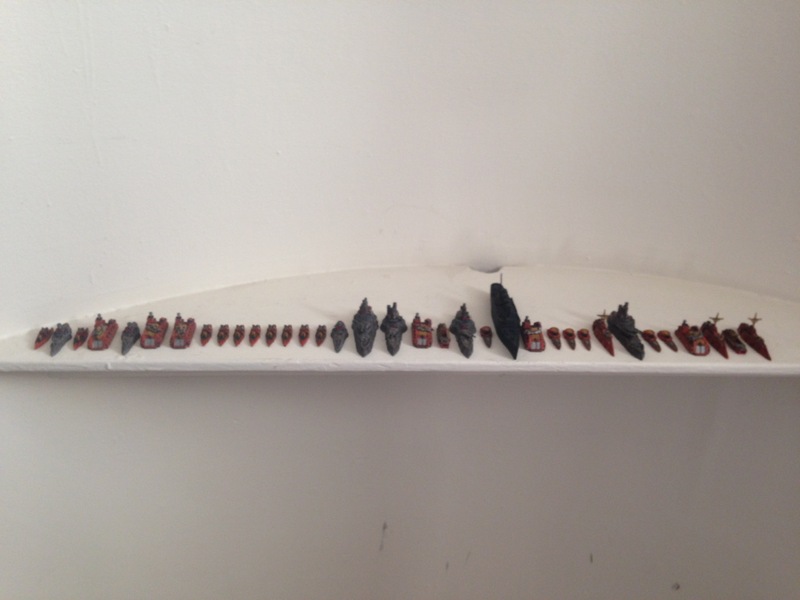 I also loved lining up the super destroyers in a line astern formation to shell out hefty, hefty pain (at least, that is, until they got beaten up by many, many Russian naval rifles). 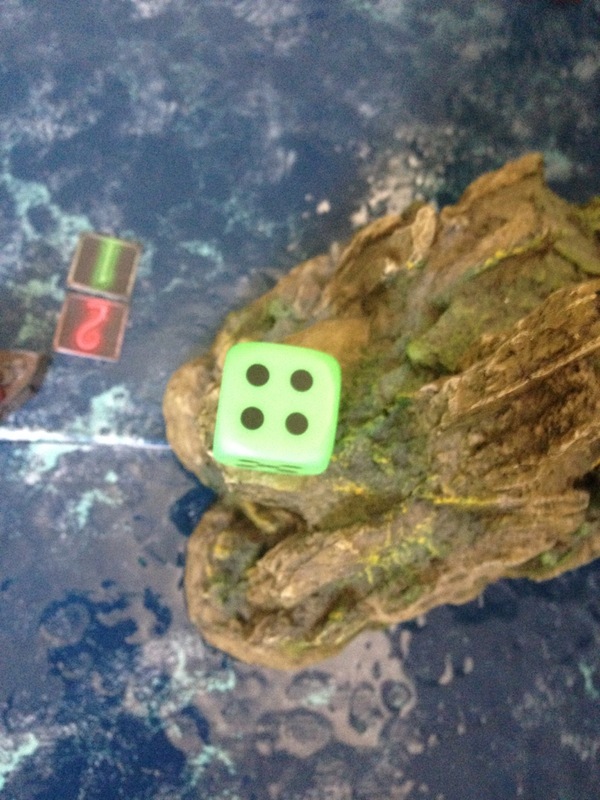 That said, there are some things I think that could be changed after this playtest to make the rules even stronger. 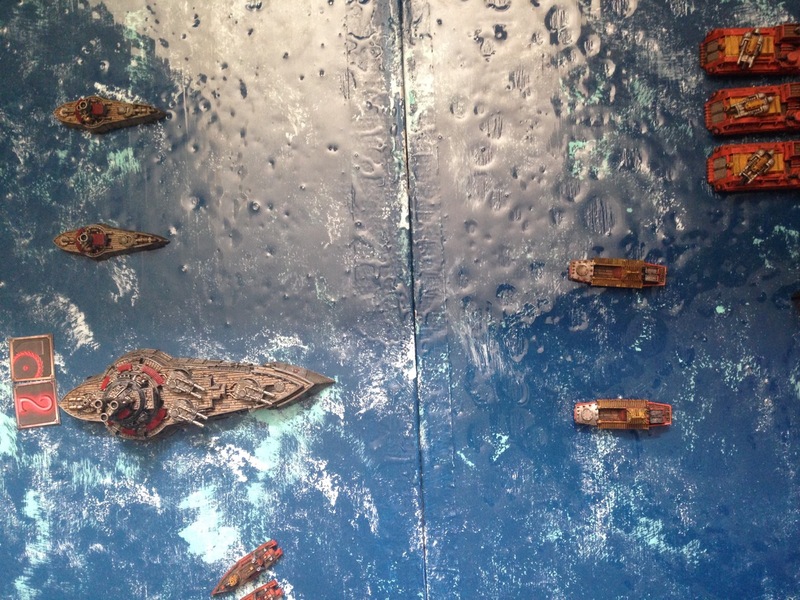 -First off, the Canons de Zibeline flagship – Le Leviathan – is a little too weak, especially as a boarding vessel and the only large of the fleet. I think it is both not durable enough and not strong enough at assaulting. The main changes I think I want to implement in order to remedy these shortcomings are adding the Experienced Engineers MAR and upgrading the crew type to Elite – it is the flagship of the entire flotilla, after all! I am also considering adding 1 to the IR, the Security Posts (1) MAR, and/or 1 point to the AP. With any of these changes – or all of them – I think it makes sense to bump the price up to 125 points for the ship. -Another change I am considering is small but fluffy: reducing the cost of SAW Ace upgrades to 5 points (instead of 10). I think a merc outfit would garner the interest of a lot of professional pilots, yeah? This change may not even add up to anything, but would equally be unlikely to make the faction overpowered. However, I could see it giving the CdZ a slight advantage when using dive bombers against enemy capitals – which would probably be a welcome boost in a force lacking in significant firepower. 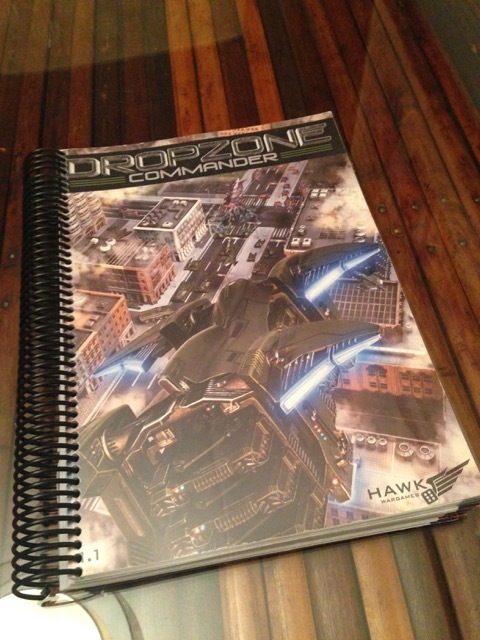 -I am also working on rules to represent scout blimps, to give the CdZ some basic aerial presence. But more on these another time! 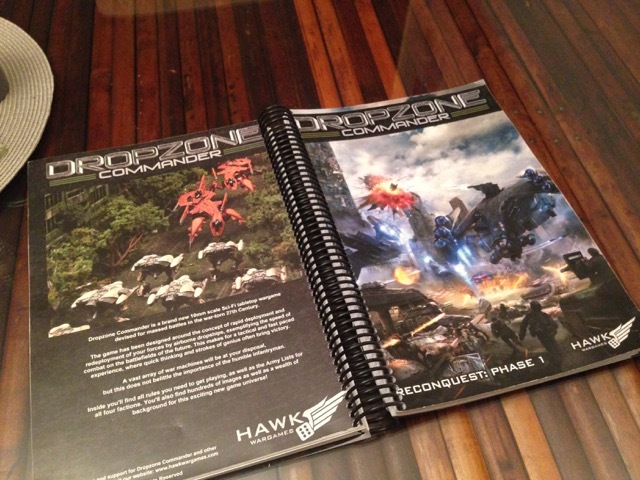 I will also say that I think in the long run, Apollo class support carriers from Operational Assets will be a natural inclusion in the CdZ force, but I do not think I want to incorporate them directly into the force guide – I’d rather force the player to take them from the Operational Assets guide. As always, I am interested in feedback and ideas for this force! I am very glad to have them mostly painted and ready to play on the table. 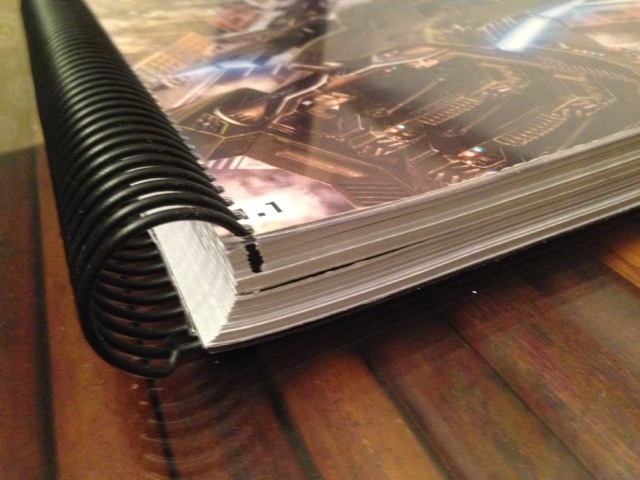 Discussions about the force guide and fleet rules are ongoing on both ManBattleStations.com and the Spartan Games forum. 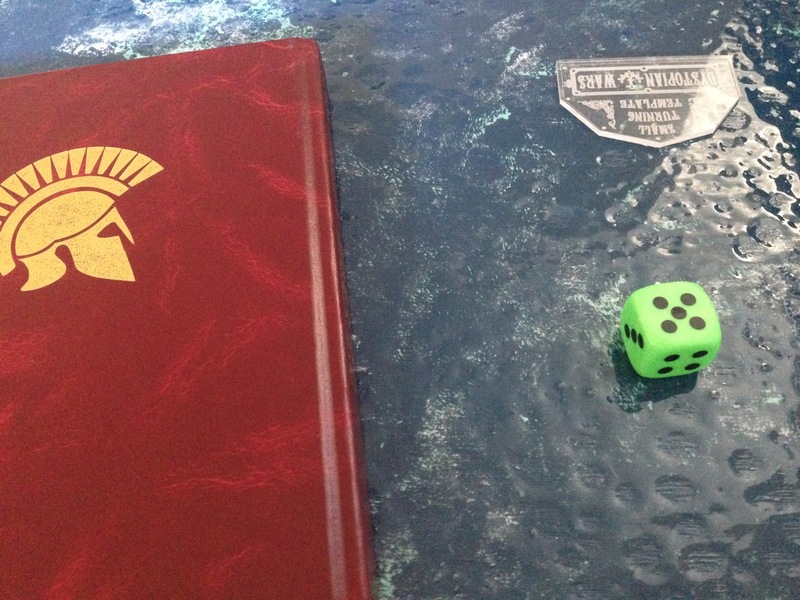 Thanks to Seb for the bloody nose he gave the CdZ, and for the time and thoughts on the rules so far!